The Software as a Service (SAAS) Agreement is for use when offering a customer SAAS. This variation is for use when client side software is licensed to the customer. This SAAS Software as a Service Client License is included in editable Word format that can be customized in Word or by using the included Wizard software. 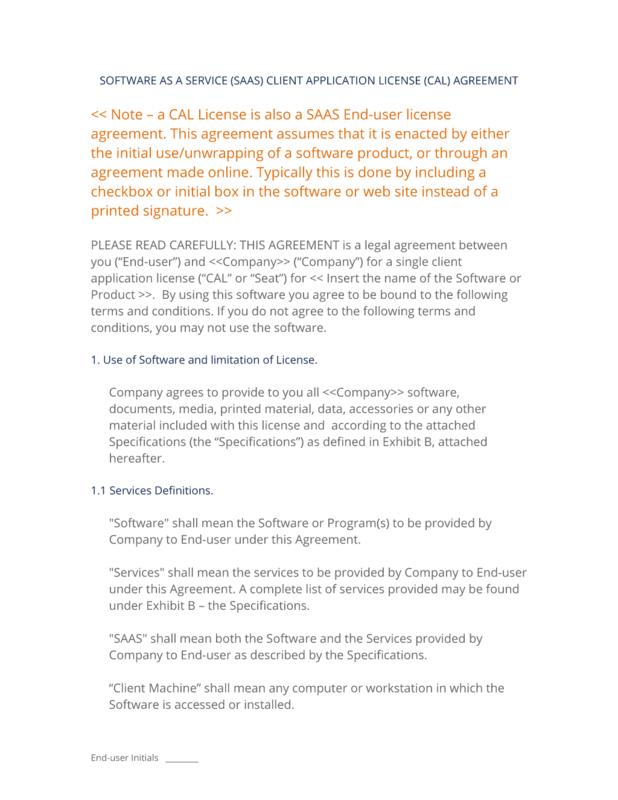 Note - a CAL License is also a SAAS End-user license agreement. This agreement assumes that it is enacted by either the initial use/unwrapping of a software product, or through an agreement made online. Typically this is done by including a checkbox or initial box in the software or web site instead of a printed signature. PLEASE READ CAREFULLY: THIS AGREEMENT is a legal agreement between you ("End-user") and Company Name ("Company") for a single client application license ("CAL" or "Seat") for Insert the name of the Software or Product. By using this software you agree to be bound to the following terms and conditions. If you do not agree to the following terms and conditions, you may not use the software. Company agrees to provide to you all Company Name software, documents, media, printed material, data, accessories or any other material included with this license and according to the attached Specifications (the "Specifications") as defined in Exhibit B, attached hereafter. "Software" shall mean the Software or Program(s) to be provided by Company to End-user under this Agreement. "Services" shall mean the services to be provided by Company to End-user under this Agreement. A complete list of services provided may be found under Exhibit B - the Specifications. "SAAS" shall mean both the Software and the Services provided by Company to End-user as described by the Specifications. "Client Machine" shall mean any computer or workstation in which the Software is accessed or installed. "Subscription Fee" shall mean the reoccurring fee paid to Company as compensation for continued use of the SAAS. "Support Services" shall mean any help, support, setup, installation, or other assistance as described by the Specifications. "Client Application License" shall mean a single license for a single registered user. "Consulting Services" shall mean any additional services as described by the Specifications. "Source Code" shall mean the readable forms together with make and build files. "Delivery" shall mean the SAAS as transmitted by Company to End-user electronically and in accordance with security measures agreed upon by both parties as described in the Specifications. "Company Materials" shall mean any software, code, data, graphics or other materials or resources transmitted to End-user in order to provide any of the services under this Agreement. Under the Company's SAAS agreement, End-user shall not be granted any rights or license to the Software or Services. End-user acknowledges that it is granted access to the Software and Services on a subscription basis and subject to the payment terms and End-user access may be governed by additional subscription access restrictions. End-user further acknowledges that at no time shall it be entitled to download, distribute, install or otherwise redistribute the Software in any form not explicitly covered by this Agreement. The End-user understands that access to the Software ends when one of the following events takes place: 1) End-user fails to make a subscription payment; 2) End-user violated the Company Acceptable Use Policy ("AUP"). At no time will End-user hold title to or ownership of any of the SAAS, Company Data or Source Code or any Materials provided to End-user during the term of this Agreement. The length of contract required is based on the type of service defined in Exhibit A. Service start date shall begin based on the type of service defined in Exhibit A.
End-user acknowledges that the SAAS is provided "as is" and "as delivered" and cannot be construed as being able to be customized or modified in any way. End-user assumes all responsibility to review all features included in the SAAS prior to signing this agreement. All support for the SAAS shall be conducted under the Service Level Agreement ("SLA"), as defined in Exhibit B. All upgrades for the SAAS shall be conducted under the Service Level Agreement ("SLA"), as defined in Exhibit B. This license may not be transferred, rented, loaned or leased in any form. Note - if your CAL is for a single user, you may want to include a transfer clause. Most retail licenses can be transferred so long as you include all materials as well as the software itself. In the case of OEM licenses or bulk/batch licenses - this is not usually the case. You may transfer this license to another user so long as you physically transfer all materials provided under this license, including all documentation and media. In the event of a transfer of license you may not retain any copies of the licensed materials. End-user shall be permitted to install the software on a single client machine or workstation. Installations shall not be permitted on shared network servers or network clients. Proprietary information exchanged hereunder shall be treated as such by End-user. This information shall include, but is not limited to, the provisions of this Agreement, product and services information, materials, software, code, pricing, or any other materials transmitted to End-user under this Agreement. End-user agrees not to (a) decompose, disassemble, decode, or otherwise reverse engineer any Company program, code, or technology installed or delivered to End-user or any portion thereof; (b) transmit or allow to be transmitted any such materials to any third party except as necessary for the fulfillment of this Agreement; (c) sublicense or allow use of any materials or use of any provided services to any third party without written permission from Company; (d) use any Materials or Services in any way not intended or expressly provided for by this Agreement. Company makes no warranties or representations of any kind, whether expressed or implied, for the SAAS it is providing. Company also disclaims any warranty of merchantability or fitness for any particular purpose and will not be responsible for any damages that may be suffered by End-user, including loss of data resulting from delays, non-deliveries or service interruptions by any cause or due to errors or omissions of End-user. Use of any information obtained by way of Company is at End-user's own risk, and Company specifically denies any responsibility for the accuracy or quality of information obtained through its Services. Connection speed represents the speed of an end-to-end connection. Company does not represent guarantees of speed or availability of end-to-end connections. Company expressly limits its damages to End-user for any non-accessibility time or other down time to the pro-rata monthly charge during the system unavailability. Company specifically denies any responsibilities for any damages, direct or indirect, arising as a consequence of such unavailability. End-user warrants that End-user has the right to use any applicable trademarks or copyrighted materials that End-user integrates or uses in connection with this SAAS. End-user may not assign or transfer this Agreement, in whole or in part, without the prior written consent of Company. In the event that End-user contemplates whole or partial sale of End-user's business, ownership change, or change in jurisdiction, End-user shall notify Company by mail, facsimile, or email no less than sixty (60) days prior to the effective date of the event. Company may terminate this Agreement at its sole discretion upon the occurrence of one or more of the following events: 1) failure to comply with any provisions of the Agreement upon receipt of written notice from Company of said failure, 2) appointment of receiver or the filing of any application by End-user seeking relief from creditors, or 3) upon mutual agreement in writing by Company and End-user. End-user shall indemnify and hold Company harmless from and against any and all claims, judgments, awards, costs, expenses, damages, and liabilities (including reasonable attorney fees) of whatsoever kind and nature that may be asserted, granted, or imposed against Company directly or indirectly arising from or in connection with End-user's marketing or Support Services of the product or Services or the unauthorized representation of the product and Services or any breach of this Agreement by End-user. The undersigned does represent and warrant that, on the date first written above, they are authorized to enter into this Agreement in its entirety and duly bind their respective principals by their signature below. The complete SAAS Software as a Service Client License - with the actual formatting and layout - is available in this Contract Pack.